Fine specifically mentioned the “mounting of the pin block in a pocket cast in the plate, and the use of exceptionally hard phenolic tuning pin plate bushings, both of which enhanced tuning stability.” Legend had it that John Lennon owned a Knight. The seller of the nightingale, Caroline Scheer, an attractive, middle aged woman who taught piano part-time, had married Peter, a Dutch businessman in 1973 and following their betrothal in Delaware, they relocated to Holland. With a portion of wedding gift money, Caroline purchased a piano of her choice. Having had formal musical training at the University of Delaware, she relished the opportunity to pick a carefully selected instrument at C. Bender, a local Amsterdam instrument distributor. “I fell instantly in love with my little Knight,” Caroline said. She mentioned that she had eyed a Baldwin grand, and two uprights, a Steinway and a Berlin-made Bechstein in the same showroom. “The European piano had a dark, somber tone,” she insisted. As soon as she had acquired her dream Knight, she christened it, “Caroline” in honor of herself. Its serial number, “46613” dated it to 1969, though it was “new’” by all accounts. I could hardly characterize the 44 inch console as diminutive and fragile. Its tone was expansive and resonant, belying its size. In some ways it played like a grand, especially in its extreme bass and treble registers that had unusual resonance and projection. This piano was amazingly voiced with a more subdued mid-range framed by defined, shimmering tonal contours on either side. It culminated in an almost glassy upper treble that gave keyboard-wide arpeggios (broken chords) a wonderful splash of sound at the top. There was only one problem that plagued this lovely piano. An assortment of odd looking, misaligned black notes were sprinkled across its keyboard that could easily distract a buyer. In reality, the freakish keys had absolutely no effect upon the piano’s performance. The anomaly could have had a variety of explanations. The Knight could have been injured in the factory before it was boxed and sent off to the dealer. But if this were the case, Caroline Scheer should have noticed it the day of her selection and she insisted that the “bad notes” were not present then. “My little piano had been placed in a container on the boat, and I know it happened somewhere along its journey,” she insisted. Caroline was certain the problem surfaced once the piano landed in Fresno, California in December, 1975. From my perspective, a conspicuous crack on the lower left side of the oak finished cabinet was more noticeable than the awkward appearing ebonies. An injury to the case could easily knock $500 to a thousand off the $3,500 selling price, a tag too steep for a vertical pushing 40 without name brand recognition. But despite the cabinet imperfection and warped looking notes, I could confidently talk up the piano to my students and other interested buyers. I was convinced that the Knight would be the perfect instrument for Fujie, my 67 year old adult beginner who needed a real piano. She had been playing an abysmal sounding Suzuki digital and hated it! Caroline leaned against the kitchen counter as I spoke. She dabbed her eye with a handkerchief after listening to me play Fur Elise, the Schumann Arabesque, and a Chopin Nocturne on her “little” instrument. “It brought back memories of my daughter practicing,” she said. 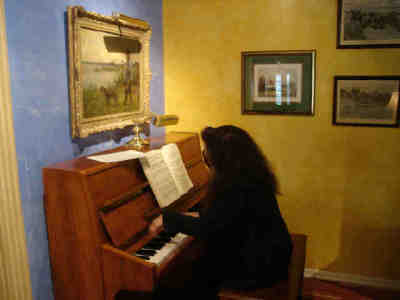 The piano, which sat on hard wood flooring, was placed against a blue wall with colorfully mounted paintings. It definitely was not the main feature of a very elegant home filled with pricey, original masterpieces of art and furniture. It so happened that a musician circulating among the crowd remarked that the piano had greater worth than the asking price, and while this boosted Caroline’s confidence about her purchase, she continued to harbor guilt about it. Only after her dear friend, “Karen,” had reassured her that the piano belonged in her exclusive care without regard to dollar and cents issues, did Caroline let go of her concerns. Though I was intensely curious about the Kohler selling price, I had never inquired about it in deference to Caroline Scheer’s privacy. “Do you mind if I try out your grand piano,” I asked her tentatively? “No, of course, go right ahead,” she replied. Within five minutes of playing the Kohler & Campbell piano, I had sized it up. A perfunctory run across its registers revealed an instrument with a dull, lackluster tone that had audible whistles from what I’d guessed were friction-related problems in the action. The sustain pedal also squeaked audibly and no matter how I approached the piano, I could not elicit any tonal beauty from it. Even if I had imagined an idealized sound and had striven to attain it, the instrument would repeatedly fail me. The “Kohler” brand portion of its name, shared with a well known sink, fleshed out its mediocrity. A basically inferior piano with numerous internal problems, it was greatly diminished by the Knight that played circles around it, though half its size. From having spoken with Caroline about her new acquisition I wasn’t sure that she realized her Kohler, nicknamed “black stallion,” was no match for the shimmering Knight, or maybe she did and there was something I hadn’t been told that factored into her decision to put it up for sale. It was this psychodrama that drew me into situations like these. “I’d like to bring my adult student, Fuji out here to review the piano,” I reminded Caroline, “and I want Mr. York, my piano technician associate, to take a good, hard look at the crooked keys and evaluate them.” I needed to be absolutely sure that the misaligned notes were not a symptom of a larger, more serious problem. “I’m so very pleased that you love my Knight as much as I do,” she said. Her words belied her intention to put her faithful musical companion up for adoption. York arrived at Caroline’s the next day, preceding Fuji by a full hour. He’d always been an early bird ever since his grandpa, also a piano tuner, drilled it into his head that being late might well be a capital crime. “If my granddaddy didn’t give me a spankin’ right then and there, then I got one from my momma later in the day,” he said. York confessed that his grandpa was quite the cusser. “He’d be lettin’ off steam and he’d cuss real bad right in front ‘a me. York had already dismantled the Knight and mounted his deeply dented metal lamp to throw light on the hammers, strings, and pins. He’d said he once tuned another Knight that wasn’t worth “nuthin,” and from that day on he’d bad mouthed all British pianos as “bein’ no good! They’s don’t know how to build ‘em,” he insisted. Nevertheless, the old man remained busily engaged, checking out the hammers. He referred to the felts that were barely grooved, meaning they’d shown little wear and tear. From their appearance, the seller’s daughter had hardly practiced or she could have fibbed that she did. Who would ever really know? I had students who swore they practiced with an egg timer forced upon them by a strict parent. Even with this abhorrent practice in effect, it didn’t necessarily guarantee quality practicing. York was looking at the tuning pins. Then he took out his tuning fork and tapped it on his knee, lifting it to his right ear. Ten cents wasn’t too far from where the note should have been. York didn’t need to make a stink about it, but I knew he would, just to have something negative to say about the piano. He’d have an excuse to show off his tuning skills. “Hey, what’s with those black notes that look misaligned?” I asked him. “Where’s them notes?” He replied. I carefully pointed out about 5 or 6 that were sprinkled around the keyboard. York then studied them with the concentration of a rocket scientist. “Okay, now listen up,” he said. I had a gut feeling that these plaguing keys should be left alone since they were working just fine. York noticed the crack on the side of the cabinet. “Well now there’s somethin’ I can treat, and makes it look a lot better. How’d this happen?” He turned toward Caroline who was in the kitchen peering over at York. She reluctantly answered. “My husband, Peter, and a few of his friends were bringing the piano out to the patio of our condo for a special event and they just lost their balance and that’s how it got nicked. Every time I think about it, I want to cry,” she said, woefully. Peter stood next to Caroline looking like an ostrich wanting to bury its head in the sand. “Well, ya should never try to move ‘a piano yerself,” York chimed in. Caroline and Peter were not amused by York who’d overstayed his welcome. He’d become a permanent fixture in the tight space occupied by the Knight. Fuji arrived just then, and made a beeline to the piano without much of an introduction. She was strictly business, sitting there, tinkering with the keys. She could barely play her “Bach Prelude in C,” but had a few short elementary pieces under her belt. “Hey what’s wrong with these black notes?” She said. Wouldn’t you know she would focus on something cosmetic! As sure as the sun set in the west, I was convinced that Fuji would not be the future owner of the Knight and Caroline sensed it, too. I nudged her off the piano bench so I could play a few more selections. York was leaning against a couch, listening to me pour my whole soul into the piano. The Knightingale responded nicely to a wide palette of dynamics. Fuji had begun to appreciate the lovely, resonance of this piano, but she couldn’t see herself parting with her money to acquire it. “What’s the asking price on the piano?” She inquired. “It’s a rock bottom $3,500!” I replied. It was a fait accomplit. Fuji was out of the running, but I wasn’t sure I’d be able to attract any buyers because of the over-inflated price tag and misaligned notes. The next day I placed the Knight piano on Craig’s List purely out of altruism. What seemed like an orphaned child needed to find a good home. I posted ads all over the Internet making sure to word each one differently so I wouldn’t be caught spamming. I posted on the London and Holland Craig’s lists to attract buyers who might be conducting business in Europe and the USA, in the hopes someone would recognize a British piano that was not a household name in the states. I had read on Piano Finders.com, a Bay area website that the Knight piano had a small but devoted following of admirers and was considered to be comparable in quality to better German or Austrian pianos. I had purposely decided not to upload a photo with the Craig’s List Knight ad because it might have exposed the piano’s freakish black keys. But I knew that I wasn’t concealing anything that would in any way hinder the piano’s performance. I chose instead to flesh out the “voice” of the piano as resembling that of a “nightingale,” and I waxed poetic about a lovely instrument whose remarkable tone haunted me day and night. Within a few days of my having posted numerous online ads, I received an astonishing e-mail from a gentleman named “Rolf Utermohlen” who resided in Holland, very near the C. Bender establishment where Caroline had originally purchased her Knight. Uncannily, Rolf wrote that he was searching this very neighborhood for an older Knight piano just like the one I had advertised. I read Rolf’s e-mail with disbelief! “I enjoyed your story of the “singing Knightingale.”I am not a pianist but I am looking for a piano for my wife who is a clavecimbelo player and needs a piano for accompanying singers in the romantic repertoire. “I look for a second-hand instrument and would have a nice instrument for a moderate price. I just traced a Knight piano which had a good sound and I consider to buy that piano. “Yesterday I read your enthusiastic message about the Knight and nervousness gets hold on me. I had a restless night dreaming of Knight pianos falling upon me. My wife does not understand my excitement altogether but she knows that such tempests never go away. “I am 57 years old, and it reminds me of the days I went to the Conservatorium for my flute study (1979) and browsed and phoned entire Holland in getting the best flute. At last a friend flute player found a flute for me in Costa Mesa, California. “I write this mail two streets away from the place Mr. C. Bender had his piano shop until 1995. A thousand of times I passed this shop without knowing it sells Knight Pianos. Last week I heard that Bender was a participant in the Knight holding and the monopoly to sell Knight Pianos in Holland. This letter was so heart-warming that I immediately forwarded it to Caroline and predicted that her Dutch husband, Peter would especially appreciate Rolf’s communication for its praise of the Knight. Dear Shirley,” My wife and I visited Arnhem to see 2 Knights. The first was an older one (19.000 series, made 1958-1960). Then another, near the serial number 32162 (the number 81000 I gave you appeared to be a patent number not the serial number!) “It was an interesting day, for the instruments were of a different character. It was obvious for me that both Knight instruments had a clear tone. The older one measures 1.05 meter and I heard a little lack of depth in the bass section, but still a strong tone for such a small sized piano. My wife found some unevenness when pressing some of the keys, probably caused by intense use of the piano. “At the moment she started playing on the next Knight, I had immediately a fantastic feeling about it. Being the sound is slightly less round than the first, this instrument resonated in the whole room with a shimmering tone! And I was dreaming of it again last (K)night… It had only a crack of 10 cm in the soundboard at the top in the left corner. “For both pianos we have to pay $1500. It is worth the money, but added with transport we found it too much. Moreover we were the only persons in Holland who are really interested in these instruments…. “Last evening we went to see our last Knight. I found it a very little bit less shimmering, but still very good. It stands on a vinyl floor in a corner of the room. The instruments of Sunday stood on a wooden floor and we see the ones in daylight. It is always difficult to compare instruments in different rooms. “I am sorry that I did not yet answer your last mail. Indeed I got your mail and I loved the photos seeing you playing on the Knight. Within a short time I hope to make some photos myself. Beforehand I have to apologize that my hairdress is not so beautiful as yours. “Last week my Knight piano arrived. I bought it around six weeks ago. I found $600 too much so I offered $500 and the seller accorded (I think he was glad to get rid of the instrument.) Then I had to manage the transport from Leiden to Zaandam. He offered to move the piano for $50 around the middle of May, and so the Knight arrived Wednesday last week. “For the first time I felt a little disappointed to hear the sound in my own house. Certainly I believe that “your” Knight was a selected specimen. Moreover it was the end of a period of looking for an instrument, and, like a good Dutch proverb says, ‘possession of the thing is the end of all pleasure.’ Looking back, it reminded me of a period in February and March in which I was looking in a fanatic way for a piano, and simultaneously there were your evocative web mails about the Queen of Knights in California. It was the period of sleepless nights and restless checks of advertised pianos. “After I had made my decision, I kept looking for Knights and, always, there are in my thoughts other, better, cheaper, and more interesting pianos (Knights)! “For the moment it all has come to an end. One has chosen his instrument and one has to live with it!” Lovely greetings, Rolf Utermohlen. Caroline and Peter had the patience of saints as they awaited a buyer like Rolf to approach them with a serious offer. I had even made a modest bid on the piano that I could ill afford! Caroline refused my first offer on her piano, and awaited another after she countered. As we continued to exchange e-mails, a creeping tension weighed upon our relationship that no longer permitted me to continue the bidding. We had become adversaries in this transaction, battling for financial control of the Knight so eventually I withdrew my final offer and went back to representing her lovely piano in the free marketplace. “I am purchasing the item for my nephew who just graduated from the (?) music school…..hope it’s in good and presentable condition. Surely I would have arranged for a meeting with you, if not for my present official assignment in Ontario. “Let me have the weight of the item and your personal information to receive the payment. “My hubby will make arrangements for shipping. I was confused by the emails and whether they were legit. A part of me knew this person was a shady spammer, and I was probably bait on a hook, but I still needed to see the whole thing played out. “Please provide your phone number and also call me at (559) —.—- If you are interested in the piano, you should consider seeing it and playing it first. The buyer prefers that the piano purchase be made in person only. Chillen’s subsequent reply was the giveaway! “Thanks for your kind gesture. “I am presently with my hubby in West africa (not capitalized) on a research project. I came in for the killing!! As luck would have it, the Knight drama finally reached a denouement. A Bay area woman who had a cultivated interest in fine pianos, came forward to claim the Knightingale. I called Caroline about two weeks after the Knight was moved out of its innocuous corner and replaced with an ornate, antique desk. “How are you feeling since the Knight was taken?” I asked. “Well, I’m very happy that it’s in the loving care of a good owner,” she answered. “Did you cry at all?” I inquired. “Well, not in front of the three weird looking people who hauled it out. This one guy looked like a pirate with tattoos all over his body. After the Knight was gone, but never to be forgotten I had one last question for Caroline Scheer that had haunted me ever since I laid my fingers on her piano. There were two ways to look at her answer. I couldn’t help but chuckle at the double entendre which for me, eased the pain of the Knight’s departure. Yes, I thought, perhaps, she had gotten what she deserved. Thank you so much for the Knightingale story. My husband’s family has a beautiful Knight piano and I never appreciated it as much as I do now, having been properly educated. I cannot figure out if it is teak or rosewood. It has a “tiger-eye” look to it that does not fit with teak, although the family has a great deal of teak furniture. It has kept it’s tuning extremely well and is very beautiful to look at, as well. Unfortunately, the piano player in the family has passed away and we are considering selling it on Craigslist (Sunnyvale), if you know of anyone else who has a passion for Knight pianos. Thank you for sharing details about your Knightingale. About a year or so ago I heard from another Knight owner in San Diego who was infatuated with his musical treasure and sang its praises. So nice to get responses like these. If I know of an interested party I will let you know. Thank you, Shirley. You know, I am truly envious at how you musicians are drawn like a magnet to an instrument. It must be the greatest feeling in the world to make music. Yes, I am blessed as are others who devote their lives to music-making. And if I find an irresistibly beautiful sounding piano, I must have it or place it in a good home. Very good piece. I am living in Jamaica and just purchased a 1962 Knight. The piano is highly respected here as most of the teachers were trained in England. Thanks for sharing. Yes, the Knight is a wonderful piano.